Cape Town, South Africa, July 17, 2014--The Committee to Protect Journalists condemns today's convictions for contempt of court of an editor and lawyer in Swaziland. The Swaziland High Court convicted Bheki Makhubu, editor of the independent newsmagazine The Nation, and human rights lawyer Thulani Maseko in relation to articles that appeared in February and March criticizing Swaziland's chief justice, according to Makhubu's lawyer and a report by The Associated Press. The two have been in custody since April and denied bail throughout. They have not yet been sentenced. The penalty is usually three months in prison or US$3,000, the lawyer said. It is not clear if the journalists will appeal. CPJ research shows that most of Swaziland's principal media outlets are controlled by the state or choose to self-censor. King Mswati III owns one of the two daily newspapers and employs the editor of the other as an adviser. Media freedom advocates regard The Nation, which is owned and published by Swaziland Independent Publishers, as the only independent voice in Swaziland. "Today's ruling is an indictment of the thin-skinned Swazi judiciary that serves a monarch and denies citizens the basic right of freedom of expression," said CPJ Africa Program Coordinator Sue Valentine. "We call on authorities in Swaziland to release Bheki Makhubu and Thulani Maseko immediately." The two were initially arrested in connection with separate articles each wrote that criticized Swaziland Chief Justice Michael Ramodibedi. In a February column for The Nation, Makhubu criticized Ramodibedi for contempt of court charges against the government's motor vehicle inspector, who was arrested after impounding a vehicle used by another judge, according to news reports. The individual was released on bail, and his trial is pending. Maseko wrote an opinion piece, "Mandela: lessons from a great man on leadership," which was also published in The Nation's February issue, in which he criticized the state in connection with the motor vehicle inspector case. 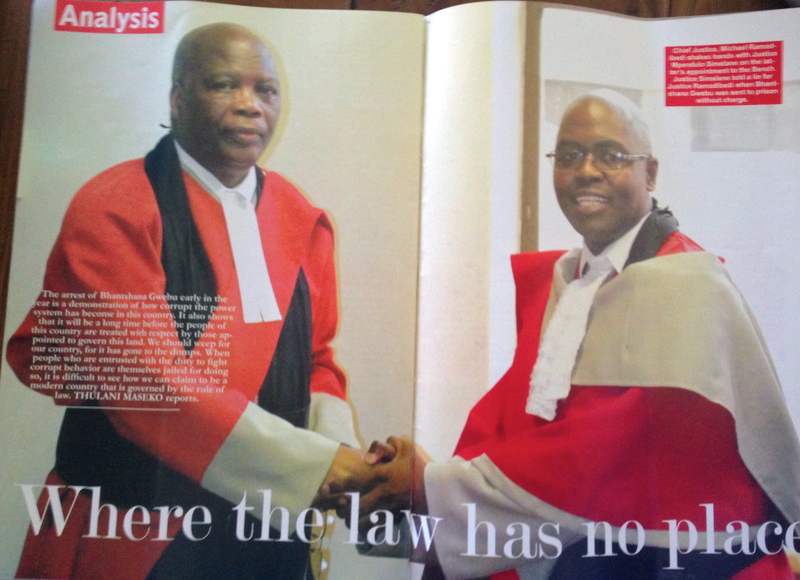 Another High Court judge, Mpendulo Simelane, was also mentioned in another one of Maseko's critical articles. Makhubu and Maseko were first arrested on March 18 on Ramodibedi's order, according to news reports. On April 6, another judge nullified their arrest warrants and ordered them to be released. Three days later, the two were arrested again, on the orders of Judge Simelane who said they had failed to heed an April 1 court order to appear before him, the state-run Swazi Observer reported. Makhubu has previously been convicted of contempt of court. In April 2013, the Swaziland high court sentenced him to a fine of $20,000 or two years' imprisonment in connection with stories he published in 2009 and 2010 that criticized Ramodibedi. Makhubu appealed the sentence successfully in May 2014 when the Supreme Court handed down a fully suspended three-month sentence, provided that he is not convicted of any offense of scandalizing the court over the next three years.